Worksmart, inc has developed and is now ready to deploy a unique watercraft equipped with multiple technologies. Surface Penetrating Radar is installed to scan shallow bodies of fresh water for anomalies buried deep in the sediment. This craft was primarily created to search the bottoms of filled water retention areas and other small bodies of water contained and adjacent to industrial sites. These have in the past been potential dumping grounds for clandestine items. 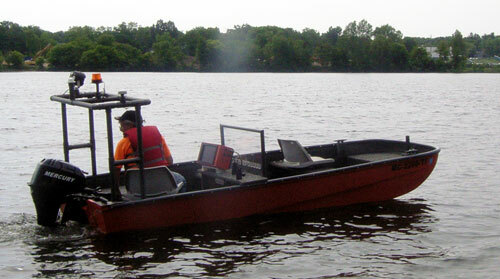 Boat mounted SPR also has the ability to profile sediment layers, locate filled channels and material types. In addition to Surface Penetrating Radar this boat is equipped with a state of the art Humminbird side imaging sonar system. This allows us to view the subsurface in a three dimensional image. Potential targets are quickly found as unusual profiles which can be marked using a very accurate GPS integrated in the Humminbird. Then the Surface Penetrating Radar is used to further investigate any potential targets. All of our specialized metal detectors can be used with our boat since it has been constructed using the least amount of ferrous metal. No metal in the front of the boat makes it a perfect platform for our down hole metal detector. 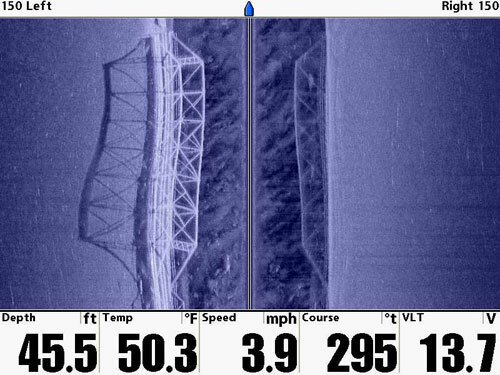 these unique capabilities are complemented by a Humminbird side scan sonar. This unit gives us a unique look at bottom features. Potential targets can be quickly identified or marked for further investigation by our surface penetrating radar or subsurface metal detectors.